We are seeing a lot of app updates lately. A lot of them are bug fixes or tweaks that folks asked for and the developer delivered. There are quite a few Penultimate fans around the office, an app that brings the free form of a stack of Moleskin notebooks to the iPad. Create ones to jot in at the coffee spot, another for quick notes at the office and another for things around the house. Everything in free form electronic ink so there is no limites… other than a single default pen. Now, a recent update brought us colors and pen widths, yea! 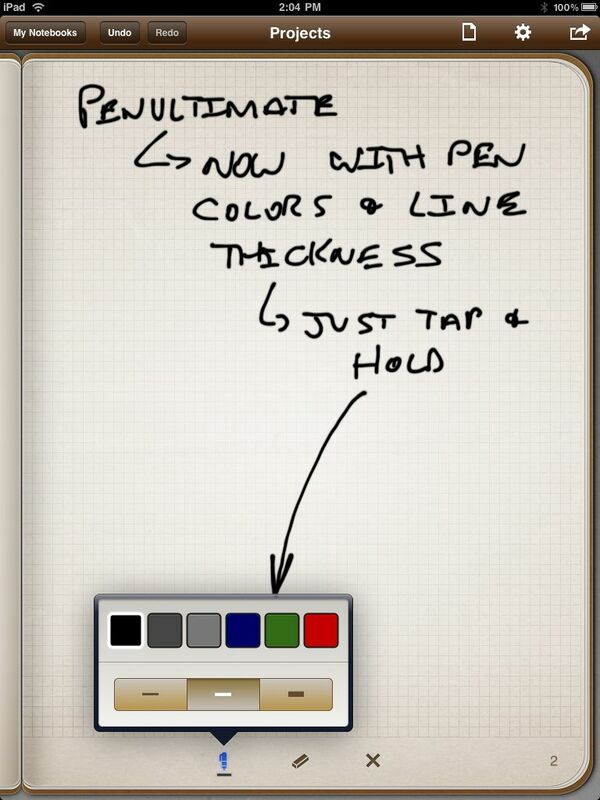 Just tap and hold on the pen icon at the bottom of the page and you get a quick popup of options. Change colors for level of importance or who the note is in reference too. Great for doing a fast free form wireframe with others too.